After a five-year hiatus, Singapore Airlines is set to relaunch the world’s longest commercial flight, bringing back New York (Newark) Singapore service in October. Singapore Airlines’ officials, along with representatives from the Singapore Tourism Board and Changi Airport Group, unveiled the news last night (June 6) at an industry event at The Omni King Edward Hotel in Toronto. 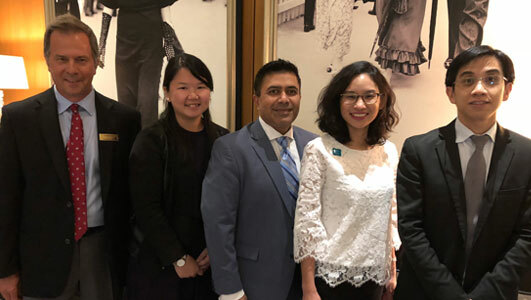 Pictured at the Toronto event are (l-r) Les Kovacs, Singapore Airlines, Magdeline Zee, Changi Airport Group, Kamran Ahmed, Singapore Airlines, Jaclyn Tan, Singapore Tourist Board, and Ee.